Presented On US Sports Net by BPI Sports! Dr. Brett Osborn: That data should be there. You should be able to figure that out. I actually don’t know the number, but you should be able to figure it out. James: Here’s why I’m asking. They say that a healthy person’s liver can produce about 180g of ketones a day. So my question is, if one of the main benefits of producing ketones is to fuel your brain, at what point is there enough of these ketones left over? Because again, I think people associate ketones with efficiently burning fat. They’re saying, “If my liver is turning fatty acids into ketones, not only is it fueling my brain, but it’s running my body.” Is that true? Dr. O: That’s very true. James: Can you convert enough fatty acids into ketones to have an additional benefit outside of just normal lipolysis? Dr. O: Look, the bottom line is this. If you’re starving and you’re 20 days in, is your glucose gonna be too? No. It’s not. You’re always gonna have enough glucose no matter what. The answer is yes. We don’t know how much you need to have in excess. I can only tell you that you’re going to have plenty of glucose to also subserve your brain, subserve your skeletal muscle, etc. I don’t know percentage wise. That’s a very, very difficult question to answer. But what I can tell you is that there’s plenty of glucose floating around in your body even if you’re 30 days into a fast, even if you’re 40 days into a fast. There’s plenty. You’re never going to be hyperglycemic where you stroke your brain. It’s just not gonna happen. By virtue of the ketones, by virtue of the glycogenesis that’s being done at the muscular level. And you also have plenty of fat to break down. Remember, you have hundreds of thousands of calories underneath your skin, even if you’re lean. That’s how come you can live so long without anything aside from water. Month and a half? No food. Zero. You can live. So say you do a glycolytic set and you’re ten reps in. In ketosis, are your muscles still burning? Yes or no? Sure you are. And the reason why is that there’s tons of muscle glycogen. You dumped all your liver glycogen but your muscle hangs on to glycogen very, very well. Even though you’re flatter. Whitney Reid: So you’re not gonna get a pump. 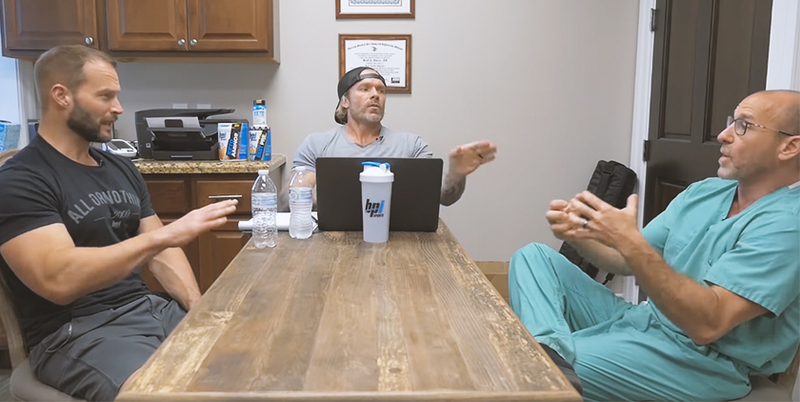 James: So that’s my question because I read somewhere that the average person stores something like 1,500 or 2000 calories worth of glycogen between liver and muscle. So let’s say that we’ve gone two months of a ketogenic diet. And we’ve depleted most of that glycogen. But you’re saying no, so that’s my question. We’re feeling pretty flat. We’ve dumped a bunch of water. Don’t get that same pump. You’re saying that even in that state, even after months, there’s still residual muscle glycogen and it’s not going anywhere? James: So even the glycogen that your liver is producing through gluconeogenesis, that is going to help maintain that. Dr. O: Nobody knows that answer. But let me give you an example. My son is fully ketogenic. He’s a rower. He’s been a rower for six years. You talk to him after 500 meters in a boat? You are burning. You are anaerobic. This is anaerobic glycolysis. And he’s ketogenic. James: So let’s say someone who’s 80 pounds overweight goes on Survivor. Twenty days in, they have plenty of stored energy, but at 20 days in, they should be in ketosis. Why aren’t they energetic? James: This is my biggest beef with a strict ketogenic diet: our body seems to have a preference for glucose. If our brain – the most important part of our body – preferentially runs off of it. By the way, 500+ calories. I don’t think people realize how many calories it takes to run that “machine” up there. But it seems like our body likes a certain amount of glucose. Yet, I know that you have to be in some sort of low insulin state, meaning on some sort of low-carb diet if you want to get lean. There’s not a diet that I’ve ever done where I got results when I wasn’t doing some sort of low-carb.